The Nursery is a place for your precious children to play, socialize with other boys and girls, have a little snack and learn about God through stories, songs and puppets. 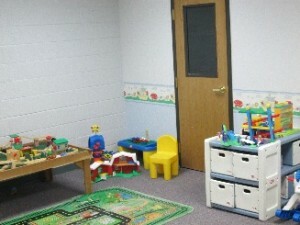 Our nursery is for babies and toddlers through the age of 3. Children who are 3 years old and potty trained will be transitioned to the preschool class. Providing children a place to explore and develop social and motor skills. We value the safety and security of each child and require all volunteers to undergo a background check. The nursery volunteers are all qualified to care for children and have a special relationship with each and every child. When do I start bringing my child to the Nursery? We recommend as soon as you, as parents, feel comfortable while, keeping in mind children experience separation anxiety around a year old. When babies start coming at an early age they build a bond with the volunteers and look forward to coming to the Nursery. For more information about Covenant’s Nursery, please contact Heather Starick.